The Cathedral Basilica is one of the first masterpiece’s of gothic art and the largest funerary monument in the world. 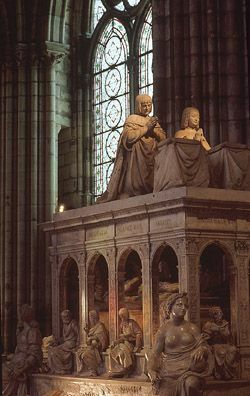 From Dagobert, the first king to be buried in the church in the 13th century, to Louis XVIII, the last, and not forgetting in between, Clovis, Charles Martel, Pépin the Short, Louis IX or the couple Henry II-Catherine de' Medici. 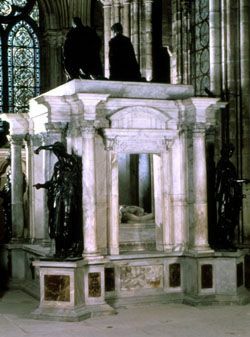 The Valois mausoleum was commissioned by Catherine de' Medici. Work began in 1572 inside the cemetery and more than a thousand workers worked on it. Firstly, 12 vaults had been planned underground, but, scarcely finished, they collapsed. Work had to begin again with only six vaults this time. In 1573, Jean Bullant (architect and sculptor, born near 1515 and died in 1578) signed a building contract and constructed the ground floor. Between 1582 and 1586, Baptiste Androuet du Cerceau (1544-1602) finished the first floor and after work was discontinued. Columns on the second floor never received their capitals and the openings were never fitted with windows. Built in the shape of a rotunda, this mausoleum that sheltered the graves of Henry II and Catherine de' Medici rose up like an enormous carbuncle, adjacent to the abbey church. One could access it through an opening pierced through the Notre-Dame-la-Blanche Chapel, situated in the northern part of the transcept. Never finished, badly maintained or not at all, and weather conditions on top of that, the Valois mausoleum was on the verge of collapse. Expertise carried out by Robert de Cotte in 1719 announced its destruction. It was demolished in 1721. Building decay had damaged the walls that supported it. It would have been necessary to repair these walls, or even to re-build them in part. This was the case for the "the big pillar on the right when leaving the Notre-Dame-la-Blanche Chapel that had to be re-built in all the thickness of its foundations" wrote Robert de Cotte in his report. Since 1610, the former vault of Anne de Bretagne (deceased in 1514) the so-called « ceremony » vault became the vault of the blood princes of the Bourbon royal branch. But, in 1683, on the death of Marie-Thérèse, the wife of Louis XIV, it had to be accepted: the Bourbon burial place was overflowing and there was no room for the Queen’s body. It became necessary to enlarge it! Work was delicate and risky and the kings’ engineers were sent to the site. They used a former chapel in order to dig a small corridor under the chevet. In the course of their work, the workers came across several tombs that were never identified. In order to avoid collapse, they had to put up supports as their work progressed. About 49 ft after, they gained access to the Bourbon vault. Thanks to this communicating corridor, it was easier to get to it and to build a more spacious vault which occupied the former crypt under the chevet, where, in the past, martyred saints were buried. This new vault measured about 59 ft in length and 16 ft at its widest part. It was destroyed during the great profanation of the Bourbon vault in October 1793.